A: Dress her up like an altar boy. Slants win in Supreme Court - R******s (Landover, Maryland NFL) live on. I like free speech, but this could get ugly. There are worse possibilities than these two. We'll see. I reserve my "right" to alter, deface and destroy. I wonder how many medics were among those swept up. We and reporters both go where the action is without participating in it. Tell the DOJ: Drop your bogus charges against Trump protesters! ... I was among the more than 230 people confined at 12th and L Streets with no access to food, water or bathrooms for up to eight hours. Acquittal of J20 defendants could set precedent for remaining trials. Not me, but it could have been at scores of other protests. I don't know Britt Lawson, but maybe we'll meet someday. Several J20 protesters could be facing 60-year prison sentences. Federal prosecutors targeting anti-Trump protesters are relying on video evidence from Project Veritas, a far-right group under fire this week for allegedly trying to dupe the Washington Post with a false story of sexual misconduct. The US attorney’s office submitted the footage in court on Tuesday as part of an ongoing trial against activists who protested Donald Trump’s inauguration and now face conspiracy and rioting charges that could lead to decades in prison. Prosecutors played the video – which reportedly showed undercover footage from a meeting of activists – one day after the Washington Post reported that Project Veritas had sent a woman undercover pretending to be a victim of Roy Moore, the US Senate candidate accused of sexual misconduct. "I found this quote. Pretty pertinent to the past year:"
And one day, too late, your principles, if you were ever sensible of them, all rush in upon you. The burden of self-deception has grown too heavy, and some minor incident, in my case my little boy, hardly more than a baby, saying 'Jewish swine,' collapses it all at once, and you see that everything, everything, has changed and changed completely under your nose. The world you live in-your nation, your people-is not the world you were born in at all. The forms are all there, all untouched, all reassuring, the houses, the shops, the jobs, the mealtimes, the visits, the concerts, the cinema, the holidays. But the spirit, which you never noticed because you made the lifelong mistake of identifying it with the forms, is changed. Now you live in a world of hate and fear, and the people who hate and fear do not even know it themselves; when everyone is transformed, no one is transformed. Now you live in a system which rules without responsibility even to God. The system itself could not have intended this in the beginning, but in order to sustain itself it was compelled to go all the way." Yep, I thought of that while I was posting. 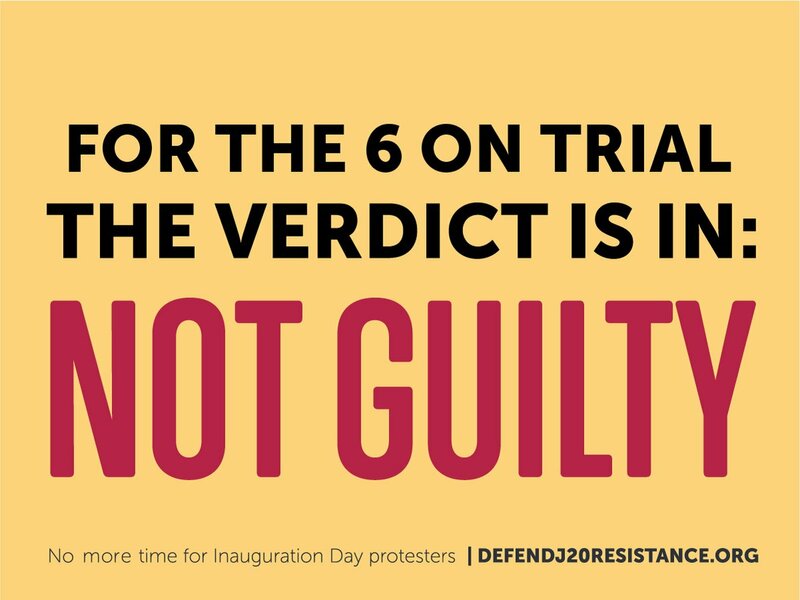 It's not everyday I have the privilege of writing to you with good news, but a DC jury just found the six defendants in the first trial of Trump inauguration protesters not guilty on all 42 charges. This is a stinging rebuke to the government, which had a detective exclusively work on this case for nine months (40 hours a week plus overtime) and spent weeks presenting "evidence" to the jury. As you were one of 50,000 people who called on the DOJ to end its prosecution of Inauguration Day protesters, I know you are as elated as I am. Assistant US Attorney Jennifer Kerkhoff told the jury during her closing that “reasonable doubt doesn’t mean very much,” but the jury decided that civil liberties, due process, and freedom of expression still have meaning in Washington, DC. As one juror told the Washington Examiner, "The jury as a whole believes it's a legal act to attend a protest where vandalism occurs." While this is cause for celebration, 188 people who were swept up in a mass arrest on Inauguration Day, including a second journalist, still face charges. And the Department of Justice announced today, they were moving ahead with their trials. This is unacceptable. Given the resounding defeat that was just handed to the government for their attempts to use guilt by association to criminalize dissent, all of remaining charges must be dropped immediately and Assistant US AttorneyJennifer Kerkhoff must resign immediately. Last I wrote to you, I told you that no matter how discouraging the present may seem, all unconstitutional attempts to chill dissent and stifle social movements have a bleak future. There's still much work to be done, but make no mistake, today is a day for celebration. If it passes, I would bet on this being found unconstitutional after the Durham County Commission wastes a bunch of taxpayer money trying to defend it. I would help organize a non-advance notice demo. just to test it. Kenneth Marcus has no meaningful history of support civil rights, but he does have a sordid history of trying to squash political speech. Not often that I'm citing and agreeing with the Cato Institute. What part of 'illegal' don't they understand? Lock the federal prosecutors up!